The Miatacage.com Endurance Racing Team has won the “21 Hours of Thunderhill” two years in a row – and there isn’t a trophy for that. The first week in December we will be heading south to do the 2009 result one better and win the bloody thing for a change. Sean Hedrick (Mr. Miatacage.com) is a longtime supporter of amateur sports car racing, in general, and Spec Miata, specifically. “The White Car” was built by members of the team with the purpose of winning this race in 2008 – we blew it… up. The short version (long version is in here somewhere) is that the throttle body broke while we were leading the ultra-competitive E2 class by what I recall being as much as 5 laps. By the time we found a replacement we were down 5 laps and not much interested in finishing second. While 2 laps down, we decided to skip an under hood check to add some oil to the motor which was consuming lots of it. We don’t know exactly how much oil came out of the four holes made in the block when the connecting rod separated itself from the piston – but it was most of the rest. In 2009 we were again enjoying a comfortable 5 lap lead when a rear hub sheered itself in two – yes, that IS weird… the car was towed back to the paddock where drivers Ken Sutherland and Will Schrader made repairs which allowed us to finish – in 15th overall and 2nd place in class E2. 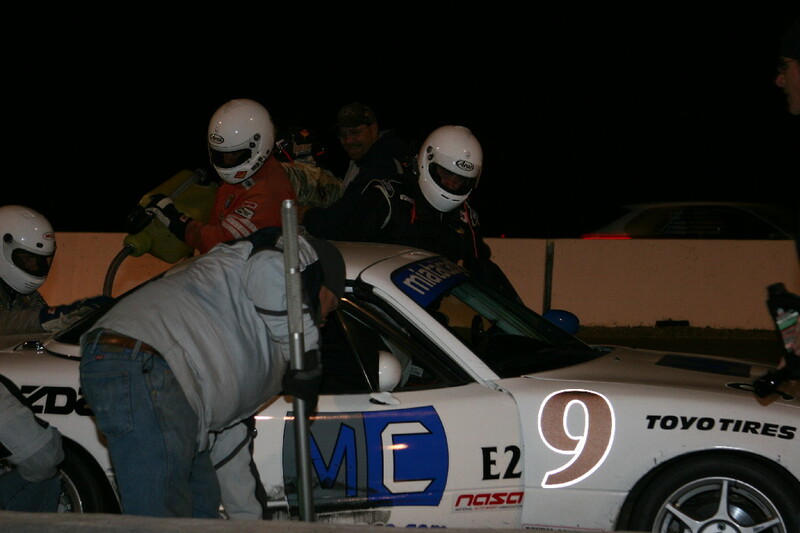 Putting on the pressure late in the 09 race. 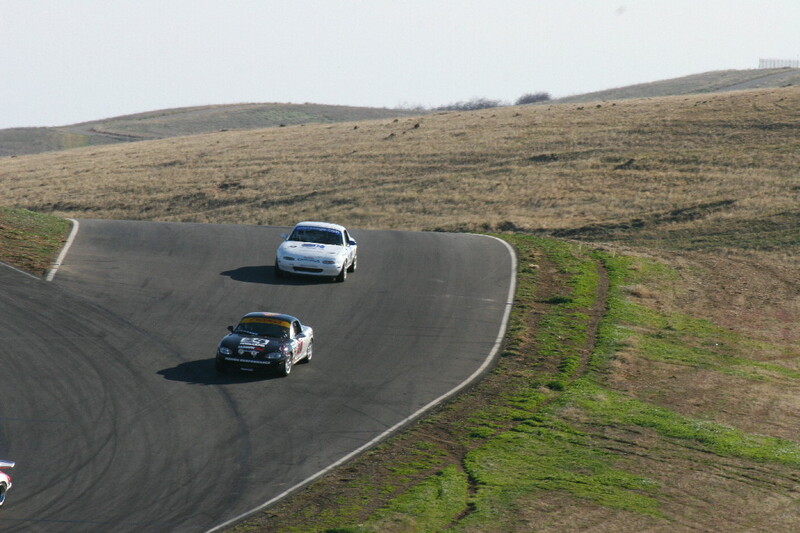 During 2009, I had raced the car a couple of times – so it was already well sorted when it came time to do the Thunderhill preparations. It really is one of the best Spec Miata’s I have ever driven. It has a safe cage with a nice roomy cockpit; it’s easy to see out of and is generally comfortable to drive quickly. In 2010, the team made The White Car available as a rental (to increase the 25 Hour budget) and it was returned molested to the extent that it needed some real “body shop” kind of attention. The shakedown that followed resulted in more damage (which was easily repaired) and then the fresh enduro motor nearly suffered a catastrophic failure which required a complete rebuild after just one lap. Everything is okay now as the team packs for the trip to Willows, California. Hopefully the strange luck has played itself out and this 3rd time will be a charm. 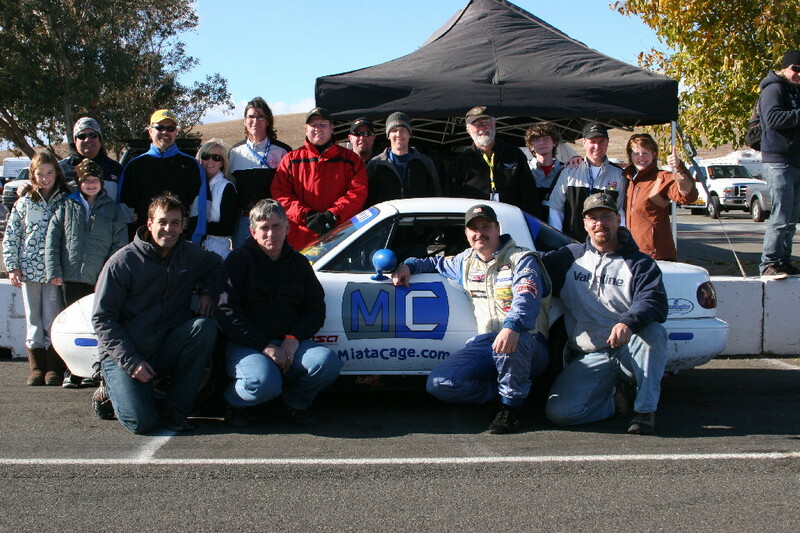 The team of previous years is mostly intact and the driver’s roster contains only Oregon Region Spec Miata Champions (amongst other substantial accomplishments) – all of them are championship and race winners. As last year, drivers Sutherland and Schrader are joined by Jon Davies and newly crowned Oregon Region SM champ Bruce Wilson. Brian Clemons will again serve as Crew Chief and Carrie Sutherland as Den Mother. The entire team has been through this exercise at least once. Jason Rawlins (the owner of my 2007 Championship winning car) and his wife Cheree will be with us again. Kevin “Big Hands” Clark and Josh McKinney are back for the second time – this time possibly with Josh’s wife Holli and their newly born daughter (start them young…). I’ll be there to fill in when needed, file and defend protests, annoy competitors and report here on the team’s progress. If there is any doubt that we race because it’s “hard”, the fact that we are returning again, should put that debate to rest. Everything I’ve written about our previous 25’s is here. it will be fun trying to beat the 2 factory backed Honda CR-Z’s with pro drivers. We Bloising Saddles from Oregon will also be going for the win in E3. have fun be safe and driver fast.